Aviation museums and museums that focus on flight of any kind are places that I love to visit. It makes me think of daring adventurers like Amelia Earhart, the Wright brothers, and John Glenn who risked everything for a chance to soar into the clouds. Aviation has played an integral part in our history and our advancement, and for many (myself included) it also represents adventure, speed, and the thrill of the ride. We’ve soared far and wide since the first hot air balloon flight in 1783, and we continue to reach for the stars and beyond. 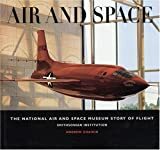 I have created a compilation of aviation museums from around the world that have held my interest, and I think are inspiring places to visit. This collection contributed by myself and my fellow travel writers, highlight places where you can find hot air balloons, warplanes, space shuttles, propeller planes, and more. 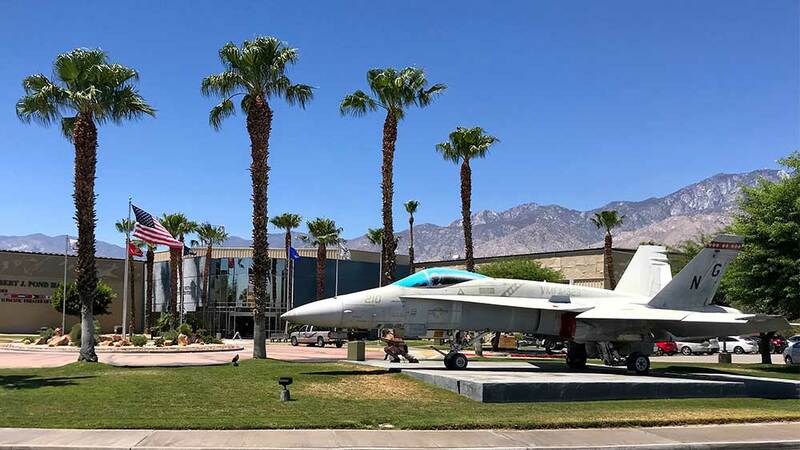 Included in this list are well-known museums like NASA and Kitty Hawk and some hidden gems such as PIMA Air & Space Museum and the RCAF Dunnville Museum. Contributions are mostly located in the United States, but some are from Canada, India, Switzerland, New Zealand, and Australia. 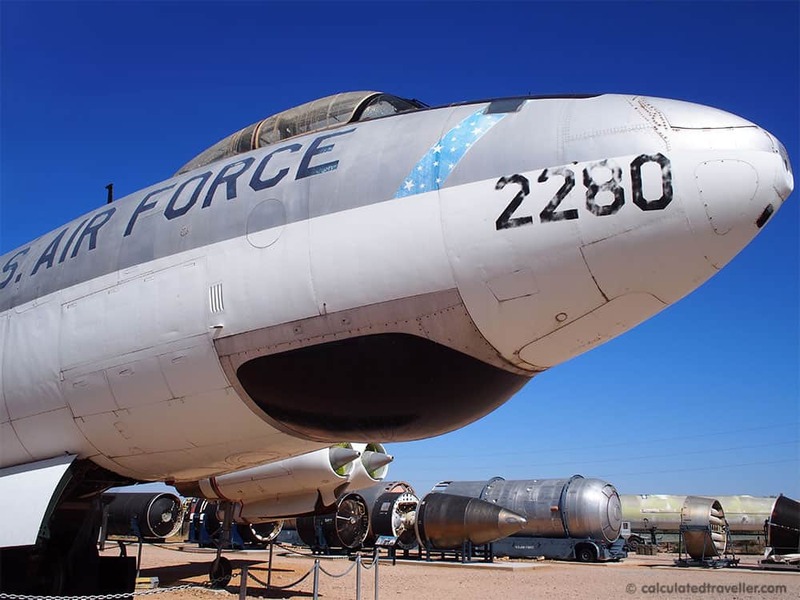 Located in Tucson, Arizona, the Pima Air and Space Museum boasts an extensive collection of military, civilian, vintage, and modern aircraft. Pima is one of the world’s largest non-government funded aviation museums and is also home to the Arizona Aviation Hall of Fame. It is situated on 80 acres of land and encompasses six indoor exhibit hangars. From its first acquisition in 1969, a rare B-24 Liberator, to its current assembly of 350 aircraft, Pima’s primary objective has always been to preserve and present the history and technological advancements of flight. Pima Air and Space Museum is open daily from 9:00 am – 5:00 pm. Single-day admission costs are $16.50 for adults and $10 for kids (ages 5-12). Enjoy the docent-led walking tours and tram tours that are available throughout the day or take part in educational activities geared to the whole family. 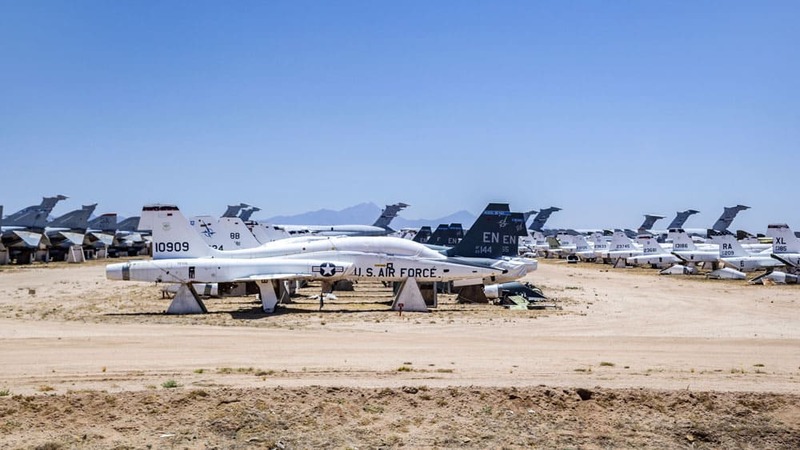 Additionally, Pima is the exclusive operator of bus tours to the Aerospace Maintenance and Regeneration Center (AMARC), a U.S. military and government aircraft storage facility also known as “The Boneyard”. The Boneyard is the largest plane graveyard in the world and houses over 4000 planes. Check out these Five Favourite Places to See in Arizona. The Commemorative Air Force SoCal Wing, located in Camarillo, California pays tribute to Military Aviation especially aircraft used during WWII. With a fleet of approximately 13 planes, known as the Ghost Squadron one gets a good glimpse at military flying during the 1930s and 1940s. One can even schedule a ride in some of the aircraft. The dedication and interest of the docents, as well as mechanics working on the planes to keep them in working order, is impressive. The passion for flying and military history is evident as you stroll between aircraft. Step on board the China Doll, C46F Commando, a transport plane and feel like you have stepped back into a bygone era of flying. Some of the other planes you will discover are the Grumman F6F Hellcat, P-51D Mustang, B-25/PBJ-1J Mitchell Bomber and the Mitsubishi A6M3 Zero. 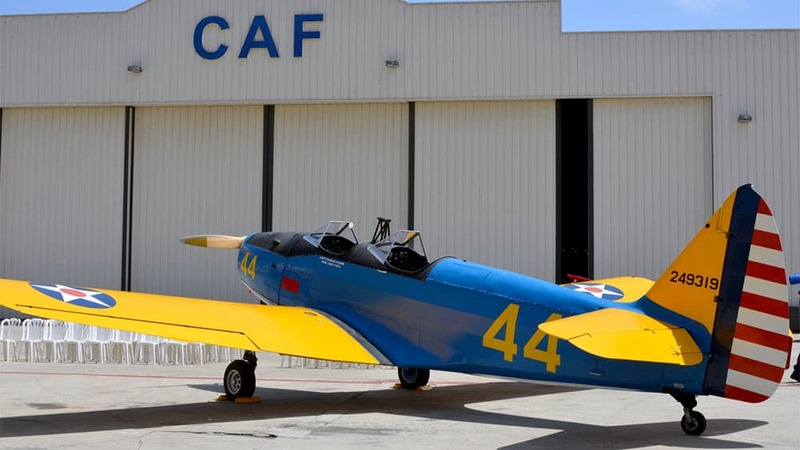 CAF’s latest acquisition is a P47. The museum consists of 3 hangers, one featuring an exhibition of artifacts from wartime aviation history and another for maintenance and repair. Many planes sit on the tarmac and can only be viewed with a tour. The museum resides on a portion of the Camarillo Airport that was originally the Oxnard Air Force Base. 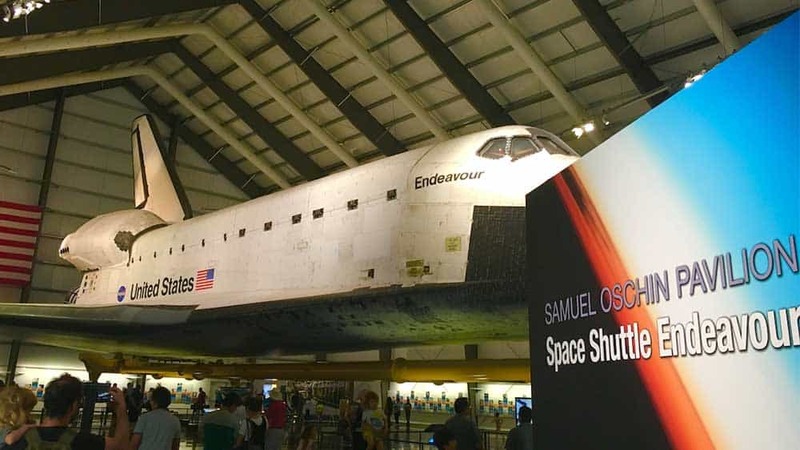 As one of the few locations to see a retired Space Shuttle, this is a must for the adventurers. With more than half of the facility dedicated to space exploration, the California Science Center offers lots of aircraft to see in and around the facility. See the Endeavour, a retired Orbiter from the U.S. Space Shuttle program. Since the Space Shuttle orbiters were built in California part of the exhibit focuses on the roles and people integral to the program. In the main building, find the Apollo-Soyuz command module. It docked with the Russian Soyuz aircraft in 1975. Then see the Gemini 11 capsule from 1966. The Gemini mission bridged the gap from the Mercury missions to the Moon-bound Apollo missions. Another must for NASA enthusiasts, see the Mercury-Redstone 2. It’s the capsule that flew a chimpanzee into orbit in 1961. Along with spacecraft, see the A-12 Blackbird, a spy aircraft from the Vietnam era. Then see a collection of fighter jets, like the F-20 Tigershark or the Northrop T-38 Talon. Since this is a free museum, it’s a favorite with school groups. Buy tickets for special exhibits and the Space Shuttle in advance. The flying boat: Howard Hughes used it to impress his girlfriends, it helped Indiana Jones find the Lost Ark, and it’s the star of the Oakland Aviation Museum. From the parking lot the Museum doesn’t look like much, but inside the hangar, you discover Oakland’s vital role in flying. Charles Lindbergh dedicated the airport in 1927 when it had the longest runway in the world; Amelia Earhart’s last flight left from Oakland, and Oakland’s World Airways conducted the last airlift out of Vietnam in 1975. By far the biggest attraction is the flying boat. There are only two Solents left since their heyday in the 1940’s, and one is here. Flying airplanes were popular because they didn’t need runways; they took off and landed on water at a time when runways were scarce. It’s easy to see how a flying boat impressed Hughes’ dates with pink stools at a pink makeup counter in an art deco pink powder room. The most significant selling point about the Museum though is the enthusiastic staff who love talking about vintage planes and the exhibitions including women in aviation, the Tuskegee Airmen; African American pilots in WWII, and the extremely dangerous Dole races. Contributed by Ruth Wertzberger Carlson. Hands-on Daily. Climb-in-the-Cockpit Saturdays. Hear engines roar during weekend airshows. Explore four enormous, pet-friendly air-conditioned aircraft hangars housing U.S. warbirds. The Palms Springs Air Museum is a rich living-history experience for every visitor. Get close; no ropes surround these magnificent warplanes. Fall in-step with one of 350 volunteer guides. Each love to show-off the museum’s “59,” plus visiting aircraft. You’ll hear first-hand accounts of flying, manufacturing, overhaul, restoration, and life. Each story is unique with passion and personality. That sailor crouched beneath the F-18? Reminds one volunteer of a teenaged son manning an aircraft carrier’s dangerous launch catapult. Another recalls a parent’s job meticulously inspecting installation-steps on a fighter-jet assembly line. A third tells an animated tale of his grandfather frantically installing radios in WWII fighters. Oh, and those pilots that look so real out front: Shrink-wrap! Bet you can’t resist a nod, wink, wave or salute as you walk past each one. I can’t. With much gratitude to all USA active-duty service personnel and our honorable Veterans, the museum is accepting Vietnam POW/MIA bracelets for a memorial display. Contact Dr. [email protected] to donate. Contributed by Adrianne Morrison of Aqua Sage Bush. Ready for an adventure at sea? 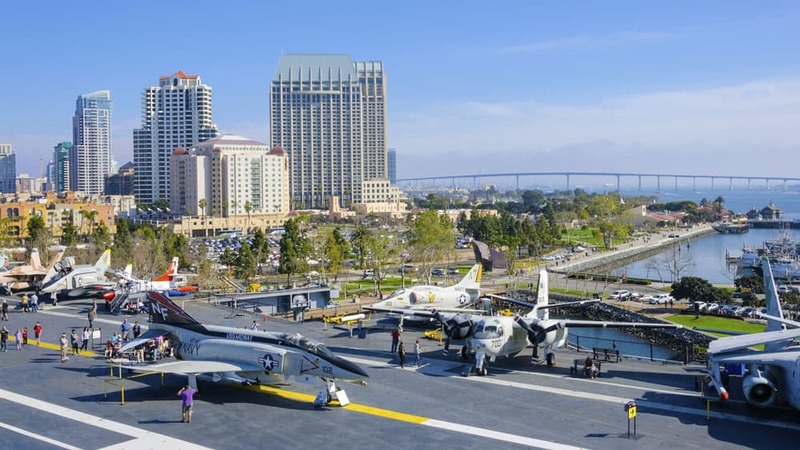 Located in downtown San Diego, at the Navy Pier, this unique museum is contained within the aircraft carrier the U.S.S. Midway. The USS Midway was the longest serving aircraft carrier in United States history – in use from 1945-1992. Over 200, 000 sailors served aboard the carrier. It now houses 30 restored aircraft including jets, propeller aircraft and helicopters. It has nearly 10 acres of exhibits and displays that also include above and below deck. Visitors can get a first-hand look at wartime aircraft, engage in the Battle of the Midway Theater, learn what it was like to live as an enlisted sailor or experience a flight simulated adventure. Admission cost includes a self-guided audio tour. The Museum of Flying, Santa Monica, California concentrates on the history of aviation in Southern California. 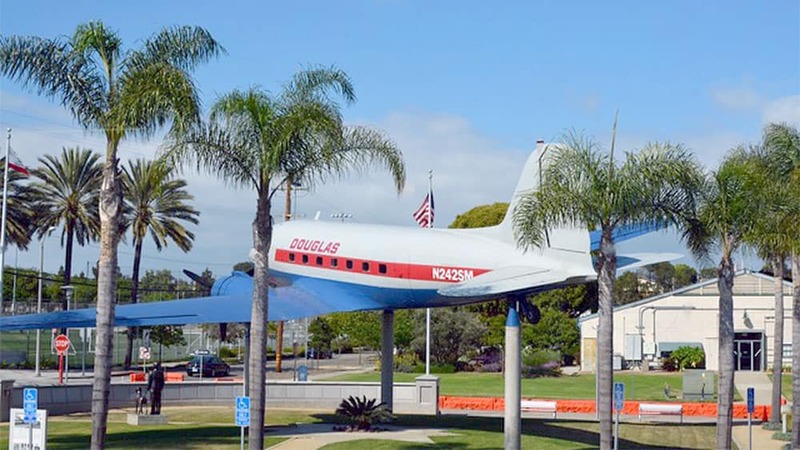 Established in 1974 as the Douglas Museum and Library, the museum has moved to different locations near the Santa Monica Airport. Donald Douglas founded the museum, and many of the artifacts represent the planes that were built by the Douglas Aircraft Company. Most fascinating is to discover the connection between Douglas Aircraft Company and Hollywood’s motion picture industry during WWII. The west coast was considered vulnerable after Pearl Harbor so to protect Douglas Aircraft from aerial bombardment, the company through the help of Hollywood created a camouflage to hide the factory from the air. They designed an elevated façade that covered the entire factory and made it look like a residential community, while aircraft construction continued beneath. Women would hang laundry or work in the garden to simulate neighborhood life at the time. Also on exhibit are the various DC planes Douglas Aircraft created over the years. One can also find the Lockheed Vega, one of the aircraft Amelia Earhart flew and a replica of the Wright Flyer. Dedicated to commemorating both the men and women who have served America, Deland Naval Air Station Museum is a rare find among military museums. This small complex began its life in the 1920s as a municipal airport for the City of DeLand. With our involvement in World War II, DeLand donated the airport to the US Navy. In 1942 DeLand Naval Air Station became active. In 1995 the DeLand Naval Air Station Museum was opened. DeLand was pivotal as a training base for Navy pilot and gunnery teams who flew the PBO Ventura, PB4Y-2 Privateer patrol bombers, and SBD Dauntless dive-bombers. As you walk through this small museum, housed in the former Master of Arms Residence, what strikes you is the massive amount of memorabilia that covers every square inch of the building. 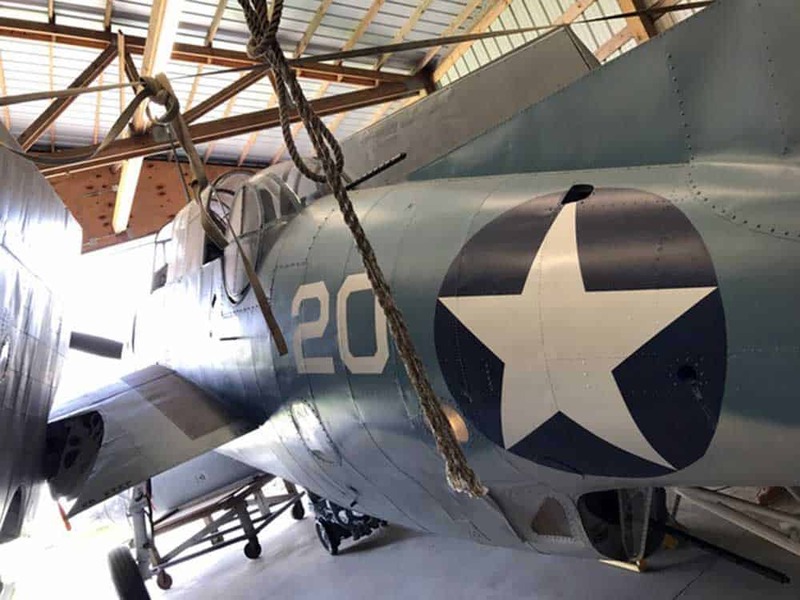 There are historical artifacts, veteran’s mementos, military art, and a collection of aircraft flown during World War II, originating right in DeLand from Naval Air Station DeLand. If you are looking for a small, intimate military museum where the docents recount stories of what life was like as a young recruit here, then plan a visit to DeLand Naval Air Station Museum. Betsi Hill is a freelance writer & blogger at Betsi’s World. As close as most of us will get to space, the NASA Kennedy Space Center is a gateway to the stars. NASA is located on the East Coast of Florida this visitor complex offers a full day’s worth of adventures and activities. Created in 1963 in response to the growing fascination with space travel, it is now one of the top travel destinations in the United States. Visitors can expect to be inspired by the fun and educational activities like training to be an astronaut, touring a spaceflight facility, and lunching with an astronaut. 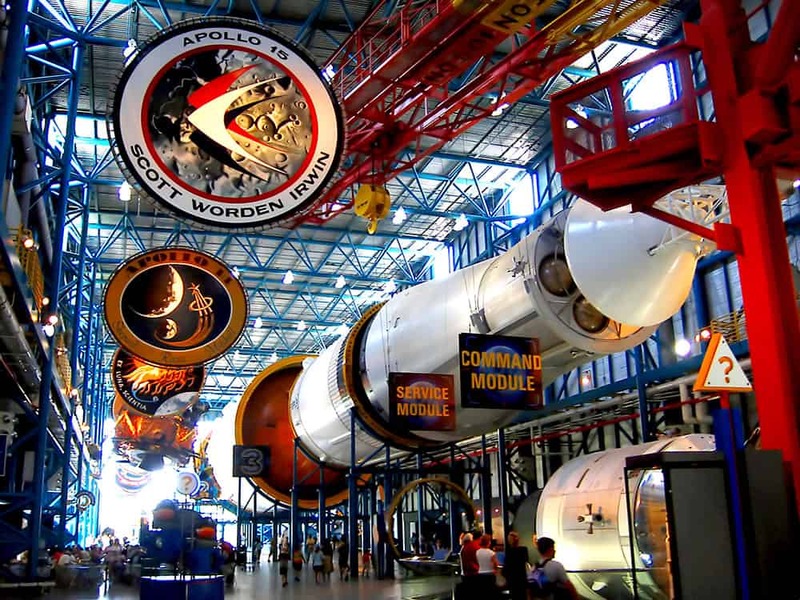 Exhibits that can’t be missed include visits to the space shuttle Atlantis, and the Apollo/Saturn V Center. A stroll through the Rocket Garden is where space aficionados can get an up-close view of rockets like the Mercury-Redstone, Mercury-Atlas 6, and Titan II, and the Juno I. Included with the admission price is the Kennedy Center bus tour where visitors can experience exclusive access to historic launch sites and working spaceflight facilities. NASA Kennedy Space Center opens at 9:00 am daily. 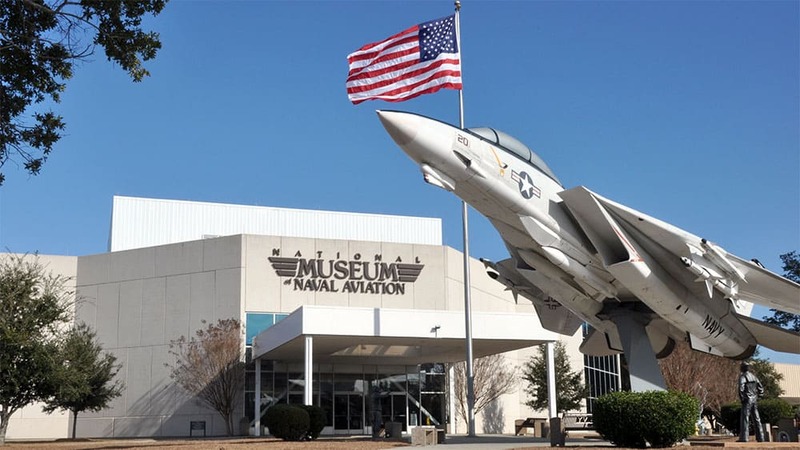 The National Naval Aviation Museum in Pensacola, Florida, just off Interstate 10 near the Florida-Alabama state line, is the world’s largest naval aviation museum. 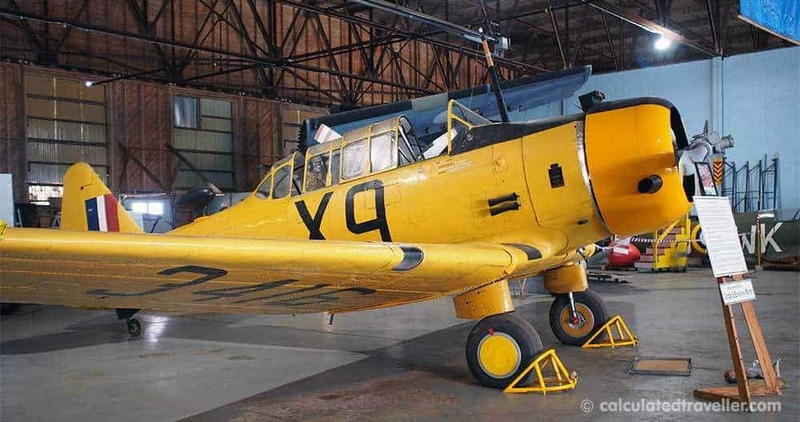 More than 150 exquisitely restored aircraft – representing U.S. Navy, Marine Corps, and Coast Guard aviation – are exhibited at the 37-acre complex that is part of the active Naval Air Station (NAS) Pensacola. The museum is also home to the Blue Angels, the Navy’s elite precision flying team. Any pilot will tell you timing is critical, and that holds true for catching a Blue Angels practice. If possible, visit on a Tuesday or Wednesday morning from March through November to see the free practice shows. Only a few bleachers are available so bring a lawn chair and don’t forget a camera. Following the Wednesday morning practices, the pilots sign autographs in the museum lobby. Once inside the museum, you can quickly lose track of time so plan to spend an entire day. Make sure you have your photo taken inside the cockpit of a Blue Angel F18 or strap into the 3-D flight simulator for an exhilarating experience. Be sure to grab a snack at the Cubi Bar Café, a replica of the Officers Club at NAS Cubi Point in the Philippines where squadrons stopped as they were transiting in or out of Southeast Asia. Since you are on Navy soil, be sure to order the delicious house specialty—Navy Bean Soup. Museum admission is free, which is fantastic because the facility uses no tax dollars. Hours are 9 a.m.-5 p.m. daily, except for holidays. Guests, age 16 and older, need a photo ID to enter NAS Pensacola. Contributed by Mary Ann DeSantis. 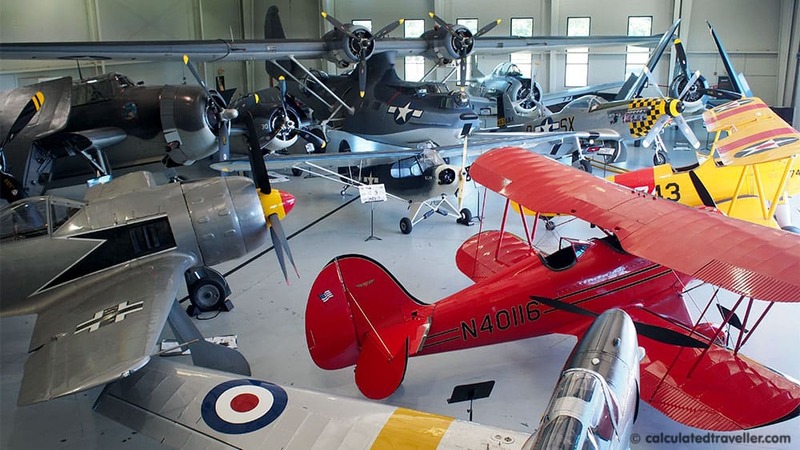 Patterson, Louisiana, which is a couple of hours’ drive from Lake Charles, is home to a small but impressive aviation museum called the Wedell-Williams Aviation Collection. While the majority of the planes are replicas from the Golden Age of Aviation, they are stunning. Wedell-Williams was founded in Patterson by engineer/designer Jimmie Wedell and millionaire financier Harry P. Williams in 1928. Wedell became famous for his designs that radically set speed records. 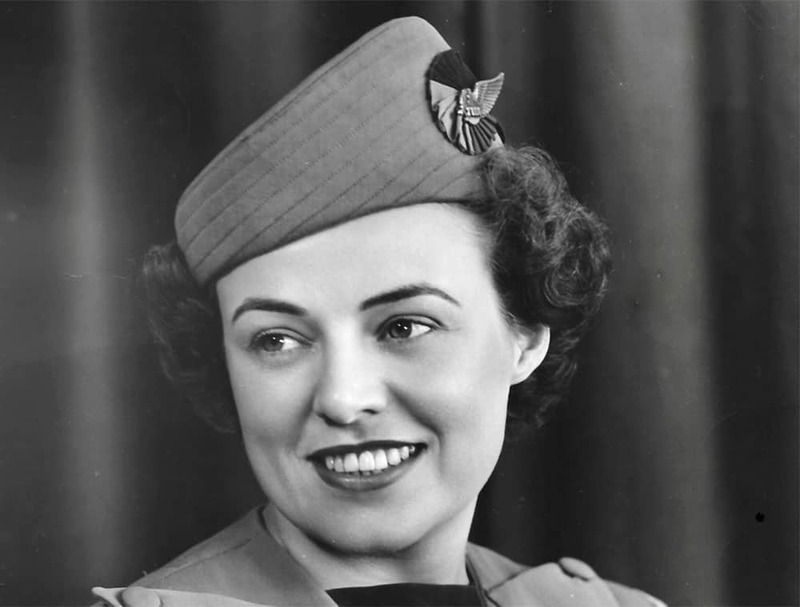 The Wedell-Williams aviation pioneers included women, such as Mary Haizlip, who set a women’s speed record in one of the company’s planes and held that record for seven years. She was just the second woman in the U.S. to qualify for a commercial pilot’s license. 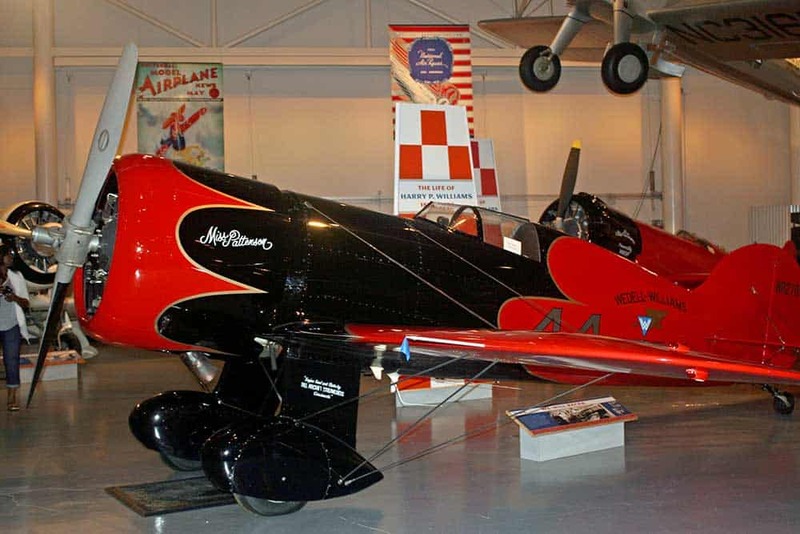 Besides planes like the bright red and black Miss Patterson #44 and the white and red Gilmore #121, the museum contains air-racing trophies, and a theater shows a film of the 1932 Cleveland National Air Races. The aviation collection in Patterson is adjacent to the Cypress Sawmill Collection, which documents the history of Louisiana’s cypress lumber industry. Contributed by Melanie Votaw of TripOutonTravel.com. Everything you wanted to know about hot air ballooning can be found at the Anderson Abruzzo Albuquerque International Balloon Museum. Located in Albuquerque, New Mexico, this museum is aptly situated just outside the grounds of the world’s largest balloon festival, the Albuquerque International Balloon Fiesta. The museum is dedicated to the history, science, sport, and art of ballooning. Aside from learning how ballooning played an instrumental role in the advancement of flight, visitors will discover how ballooning was used in history and continues to be used for sport and space travel. The science of ballooning is explored through Interactive exhibitions and educational programs, including a flight simulator. The balloon museum is open from 9:00 am to 5:00 pm Tuesday – Sunday and admission is $6 for adults / $3 for children (ages 6-17). Interested in the history and science of the atomic age, and where it can take us in the future? Then visit the National Museum of Nuclear Science and History and explore the early research and development of nuclear technology through to its modern day uses. The museum is a Smithsonian affiliate and provides educational exhibits, interactive displays, and artefacts to chronicle the story of the nuclear age. Activities at the museum include a visit to Heritage Park to see the planes, rockets, missiles, and cannons on display; tracing the study of the atom; discovering what it would be like to be a spy during WWII and the cold war; or learning about the how uranium plays a part in our world today. The museum opens daily from 9:00 am – 5:00 pm. Adult admission is $12 (ages 18-59) and $10 for kids (ages 6-17). If you hear about the Intrepid World War II ship docked at West 46th Street in New York City, you might not realize that it’s actually an aircraft carrier that’s formally called the Intrepid Sea, Air & Space Museum. So it’s the perfect place for lovers of aviation and space exploration, not just people interested in naval history. It contains a Space Shuttle Enterprise, a British Airways Concorde, and a wide array of military and civilian aircraft from planes to helicopters to NASA spacecraft such as a replica of a Mercury space capsule. Other exciting craft on exhibit includes a sleek 102-foot A-12 Blackbird plane from 1967. There are interactive exhibits as well that allow kids to climb into the spacecraft and aircraft, ride a simulated drone, try on the same kind of gloves that astronauts wear, and try typing their names in Morse Code. If you visit NY and love aircraft, it’s a must-see. 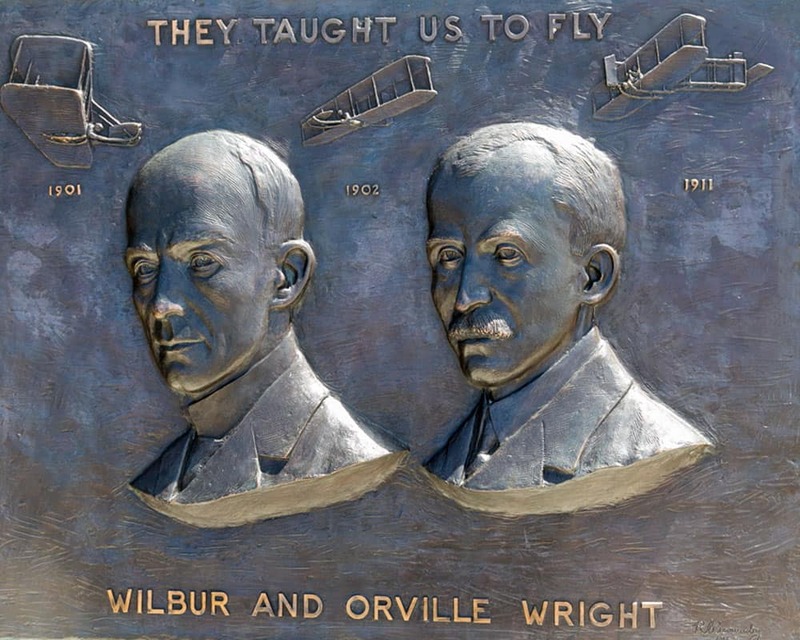 After four years of secretive scientific experimentation, Wilbur and Orville Wright brought their dream of flying to Kitty Hawk, NC. They needed the wind and soft sands of the Outer Banks for their trials. On a cold December 17, 1903, the brothers achieved the first successful airplane flights. Today, visitors can walk the distance to the First Flight Boulder and Flight Line on the grounds of the Wright Brothers National Park Memorial site. Park Rangers and signage tell how their courage and persistence changed the world forever. I explored the grounds with two of my granddaughters who completed the Junior Ranger program. We saw reproductions of the brothers’ 1903 camp buildings, stood at the place where Wilbur and Orville Wright first took to the air. We climbed Big Kill Devil Hill to see the monument commemorating the brothers’ historic achievement. In the Visitor Center, we listened to rangers who explained the principles of flight and saw a replica of the 1903 flyer. The room also showcases portraits of other famous aviators. Unfortunately, the central Visitor Center is currently under renovation until the fall of 2018, but the grounds and a temporary facility remain open. If you are interested in aviation and flight, a visit to the sacred hills of Kill Devil, NC is a must. Contributed by Debi Lander of By Lander Sea. I have a meaningful personal connection to this small but growing museum. Established in 1991 to showcase World War II aircraft, Liberty Aviation Museum, located at the Erie-Ottawa Regional Airport in Port Clinton, Ohio, began producing air shows in 1994. Since then, the museum’s efforts have gone to acquiring aircraft and aviation artifacts, restoring historic aircraft, and educating the public on aviation history. In 2012, the museum opened its newly-built facilities (museum building and hangar) to the public featuring military and local aviation. Notably, the museum is the home base of the “City of Wichita” flyable Ford Tri-Motor (when it’s not traveling around the country for air shows) and a World War II B-25 Mitchell Bomber called “Georgie’s Girl”. Its 1950s-themed Tin Goose Diner is another key attraction. Recently, the museum expanded their collection to include a commercial aviation display. I’m honored to have provided my contribution of photos and a profile of my Aunt Vi, a 1940s TWA air hostess, to this exhibit. The photos and the personal recollections of my aunt, really bring to life the display of vintage airline crew uniforms and associated items. Contributor Catherine Sweeney shares the story of her Aunt Vi in full in the associated article on her blog Traveling with Sweeney. Home of Hughes H-4 Hercules, more commonly known as the “Spruce Goose”, is the largest wooden airplane ever built, with a wingspan of 320 feet 11 inches and 218 feet 18 inches in length. 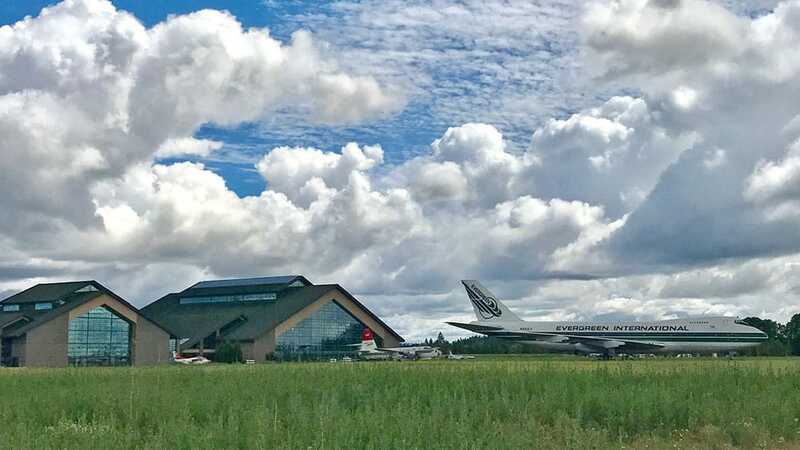 The Spruce Goose and Evergreen Aviation and Space Museum have been capturing the interests of enthusiasts since 1983. Located in McMinnville, Oregon, one hour southwest of Portland in the heart of the Willamette Valley wine country, visiting the museum can be a great addition to your wine vacation or you can add wine tasting to your museum vacation. Explore the SR-71 Blackbird, the Titan ll Missile, WWll Aircraft and artifacts and go inside the Spruce Goose. Guests of the museum will also have the opportunity to enjoy IMAX Theater presentations, take guided tours or participate in educational programs presented by Veterans. The Mission of Evergreen Aviation and Space Museum is to educate, inspire, promote and preserve aviation and space history, and honor the patriotic service of veterans. Contributed by Valerie Estelle Rogers of V. Estelle Travel. Space Center Houston, yes of the “Houston we have a problem” fame, is the official visitor centre of NASA Johnson Space Center and a Smithsonian Affiliate museum. This enormous complex houses some of the most awe-inspiring space artefacts and exhibits. Visitors can discover what it’s like to live in space, blast off in a simulated launch, or meet an astronaut. The Mercury 9 capsule, the Gemini 5 capsule, and the Apollo 17 command module are all on display in the Starship Gallery, along with hundreds of other artefacts. 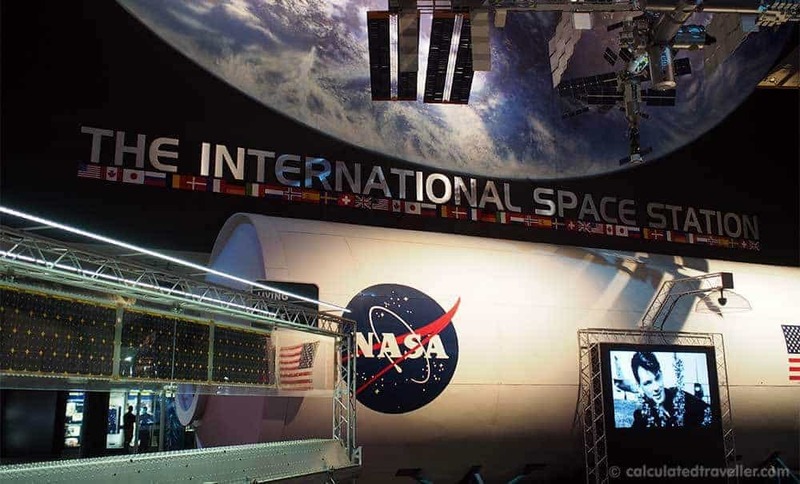 Make sure to take the tram tour to NASA Johnson Space Center, known as Mission Control and get a behind-the-scenes look at the inner workings of a real space station. History buffs will be delighted by the array of restored planes at the Military Aviation Museum located in Virginia Beach. This location houses one of the world’s most extensive collection of airworthy military planes from World War I and World War II. The collection features five hangars and 70 aircraft from countries around the world such as France, Germany, Italy, the United Kingdom, the United States and Russia. These one-of-a-kind warbirds have been restored to their original military condition and can be seen in flight during demonstrations and air shows held throughout the year. For that once-in-a-lifetime adventure, visitors can pay an additional cost to take a ride with a veteran in an authentic World War II plane. Continue your unique visit with the Goxhill Experience; stand on the balcony of the relocated and refurbished control tower from America’s first airfield built in Goxhill, England in 1940. The Military Aviation Museum is open daily from 9:00 am – 5:00 pm. Cost is $15 for one adult admission, and $7 for children (6-17). The Steven F. Udvar-Hazy Center is a companion museum to the Smithsonian National Air and Space Museum in Washington D.C. This massive facility is located at the Washington Dulles International Airport. 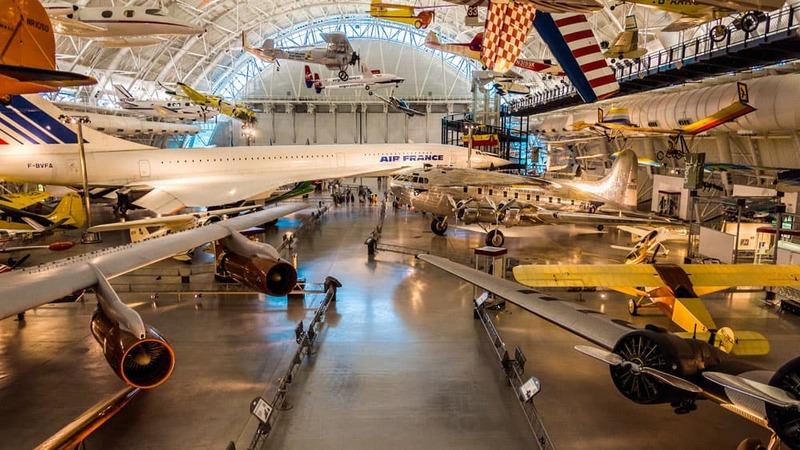 Home to thousands of aviation and space artefacts, including planes, jets, rockets, missiles, satellites and more, the Udvar-Hazy Center has something for everyone to see. Adults and children can take part in educational activities or take a tour with knowledgeable guides. Notable exhibits at the museum include the space shuttle Discovery, the Enola Gay, and the only surviving German Arado Ar 234 Blitz jet bomber. The exhibition area consists of 2 large hangers, the Boeing Aviation Hangar and James S. McDonnell Space Hangar. As an additional bonus, interested visitors can watch planes take off at Dulles and get a 360o view of the surrounding area at the Donald D. Engen Observation Tower. Still, need more? Take part in their ride or flight simulators to experience the joy of flying or watch how rare artefacts are reconstructed and repaired in the Restoration Hangar. The Steven F. Udvar-Hazy Center is open daily from 10:00 am – 5:00 pm and admission is free. 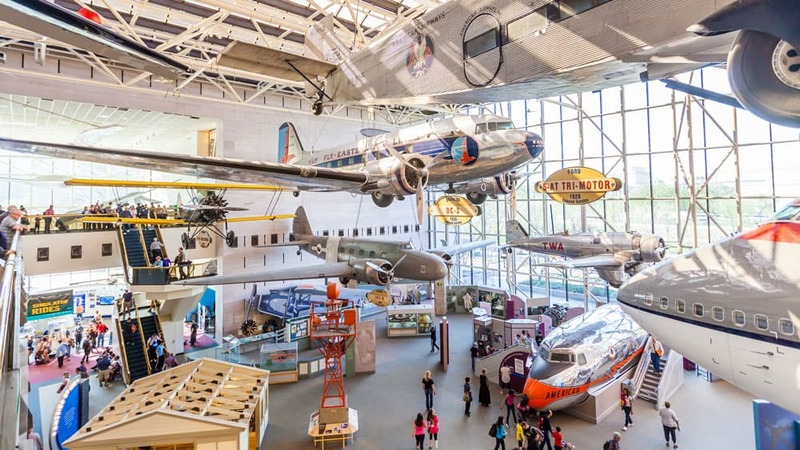 The best of the best, The National Air and Space Museum (NASM) located in Washington, D.C. is the most visited museum in the United States and 3rd worldwide. The museum offers fans of aviation, space exploration, and astronomy, limitless things to see and do. With 22 exhibition galleries to explore, visitors can take free tours, experience virtual reality simulators, observe science demonstrations, take in a planetarium show, or watch the skies from the public observatory. Historical and contemporary items are on display including original artefacts as well as one-of-a-kind replicas. Some must-see exhibits at the NASM include, the Apollo 11 command module, the Friendship 7 capsule, Chicago – the first aircraft to fly around the world, and the 1903 Wright Brothers Flyer and so much more. Admission is free for all ages, and the museum is open daily from 10:00 am – 5:30 pm. 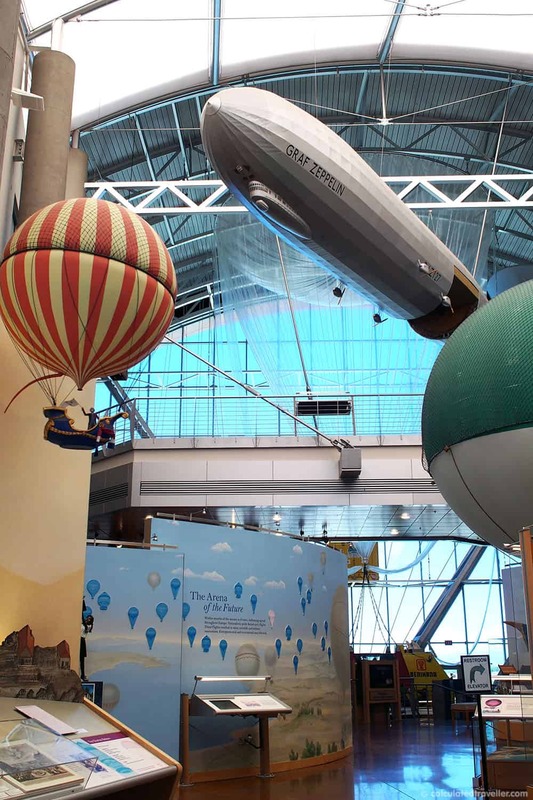 Billed as one of the largest non-profit aviation and space museums in the world, Seattle’s Museum of Flight offers a spectacular way to experience the thrill of flight for fans of all ages. For starters, step inside the stunning T.A. Wilson Great Gallery for a walk through time where visitors can observe historic aircraft like the Douglas DC-3 suspended from the six-story ceiling of the glass pavilion. Curious about the history behind Boeing’s beginnings and its trajectory into jetliners? Check out the William E. Boeing Red Barn exhibit, housed in the company’s original 1909 factory. But don’t stop there. Commerical aviation, space exploration and military aircraft each have a starring role in the museum’s outstanding collection of artifacts, documents and first-hand accounts from those on the front line of past, present and future air transportation. Plan to spend at least three- hours or even a full day wandering through the numerous exhibits and galleries. And why should airplane pilots have all the fun? You can experience the thrill of flight and try out your own flying skills in one of the featured tours like Flight Simulators or The Pilot Experience. Ready to take to the skies? Contributed by Nancy Mueller of Wander Boomer. One of the world’s oldest airlines, Qantas has a proud history, having been founded in outback Australia in 1920 as Queensland and Northern Territory Aerial Services. The first scheduled service took off from Longreach, Queensland, in 1922. Longreach lies on the Tropic of Capricorn, 700 kilometres inland from Australia’s east coast, and offers a surprising number of attractions for a town of 3,000 people. Key amongst them is the world-class Qantas Founders Museum which tells the story of Qantas through artifacts and exhibits. 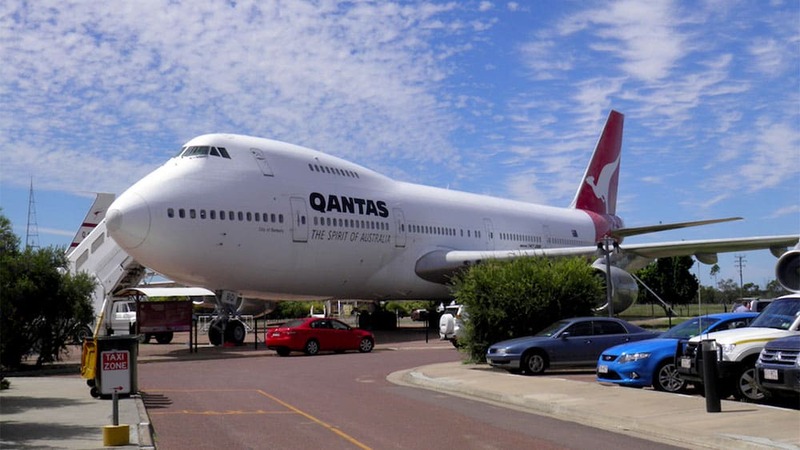 The not-for-profit community organization runs independently of Qantas, although as the then general manager Tony Martin told me a few years ago, “Qantas does occasionally help by dropping off 747s”. Museum admission includes a peek at a Catalina Flying Boat and the National Heritage-listed Qantas hangar containing DH-50 and DH-61 aircraft, while a 90-minute Jet Tour takes you through Boeing 747, 707 and DC-3 aircraft in the museum grounds. The 707, the first 707 Boeing sold outside of the United States, drips with fine timber, crystal and gold-plated fittings courtesy of a Saudi prince who owned it after Qantas de-commissioned it. The 747 Wing Walk Tour allows you to walk on the wing of a 747 for an exhilarating experience and rarely seen view of the big bird. Located in Dunnville, southern Ontario, No.6 RCAF Dunnville Museum is also known by the name No. 6 Service Flying Station. This location served as a training base for fighter pilots from Canada, Great Britain, Australia, New Zealand and the United States during WWII as part of the British Commonwealth Air Training Plan. Over 2400 pilots earned their wings here before it was decommissioned at the end of the war. Today, the museum offers a rare glimpse into the life of a WWII fighter pilot in training. On display are WWII memorabilia, artefacts, photographs, and letters; a flight simulator; and vintage training aircraft including a Yale and a Cornell, as well as a World War I Nieuport 17. Visitors can stroll through the memorial garden, dedicated to deceased service men and women, or expand their WWII knowledge in the library. The National Air Force Museum of Canada, located in Trenton, Ontario, (approximately 160 km East of Toronto) was established in 1984. This is a stellar museum for anyone interested in the history of aviation and air warfare. Located on a 16-acre airpark, it features many historical aircraft ranging from trainers, helicopters, fighters, and transport aircraft. 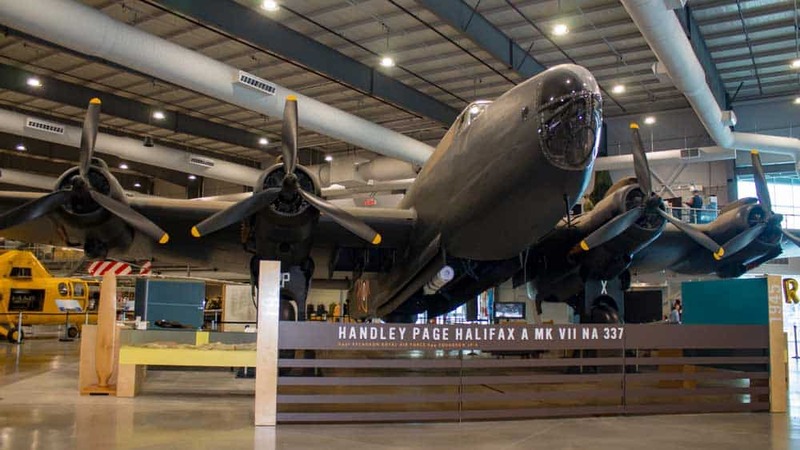 The highlight of the museum is a beautifully restored WWII Halifax bomber. There are over 35 aircraft on site, including a replica of the Silver Dart, the first airplane to fly in Canada and the British Commonwealth. The Hall of Fame is an aviation museum run by the Indian army in Leh in the district of Jammu and Kashmir. There are weapons and artillery of various types kept as reserves inside the museum. The museum is located at a distance of around one hour from the capital city of Ladakh. The entire area is governed by the Indian army and surrounded by enchanting peaks of the Northern Himalayas. The museum is located in the Leh Kargil road exhibiting the warfare equipment of the Ladakh kingdom. There are also some paintings depicted in the museum that reminds of the old era. There are distinct artillery and weapons kept inside the museum that boasts of the lost heritage in the capital. The entry fee to the museum is minimal, and tickets can be purchased from the gate to gain entry inside the premises. Contributed by Somnath Roy travel writer at Travel Crusade. 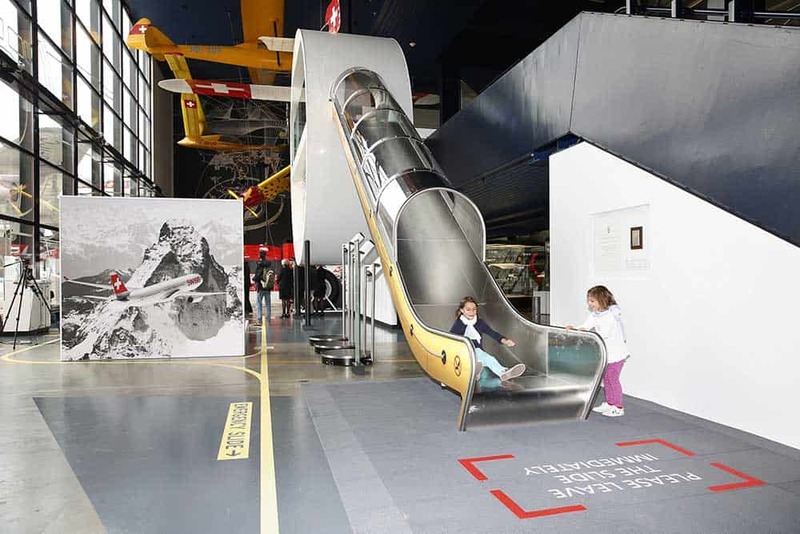 The Swiss Museum of Transport is Switzerland’s most-visited museum, wowing visitors of all ages with the depth and quality of its exhibits, on land, at sea, and in the air. Through 2018 and 2019, the museum celebrates aviation and space travel, in a newly reorganized Aviation Hall. From passenger and cargo air transport to air rescue, air sports and more, interactive displays and thousands of objects entertain and educate. Flight simulators controlled by body movement enable amateur pilots to land a commercial aircraft in Zurich, take the controls for a helicopter landing on a Swiss mountain, or navigate a flight through the Alps. An animated model offers a close look at Zurich Airport, from check-in to take-off and sorting luggage. The museum’s amateur radio station broadcasts worldwide, and visitors can listen in on live transmissions and practice Morse code. A new Space Travel exhibition highlights Switzerland’s aerospace industry. Together with the museum’s Planetarium, it inspires young explorers with immersion in space flight, past, present and future. Visitors can spacewalk in starry skies, learn about rocket engineering, and see what the Swiss are up to in ground-breaking research and deep-space exploration projects. The Swiss Museum of Transport is open 365 days per year, 10.00-17.00. The Knights of the Sky exhibition here containing Sir Peter Jackson’s personal collection is displayed through a series of dioramas and seriously lifelike mannequins. 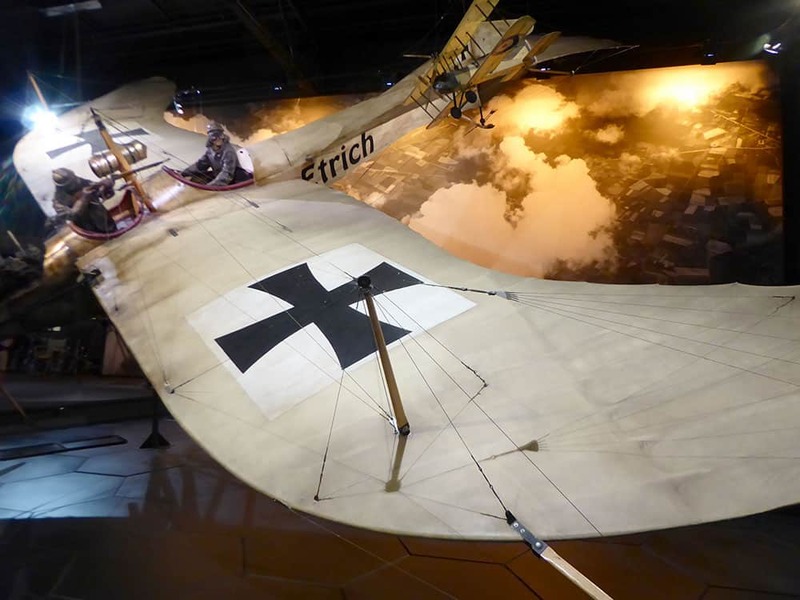 Continuing the theme of lifelike dioramas and mannequins by Weta Workshop, the Dangerous Skies exhibition displaying aeroplanes from WWII is equally stunning with very rare examples of aviation history on display. The Omaka Aviation Heritage Centre is a true jewel – its well worth making a special effort to visit and see some incredible history. 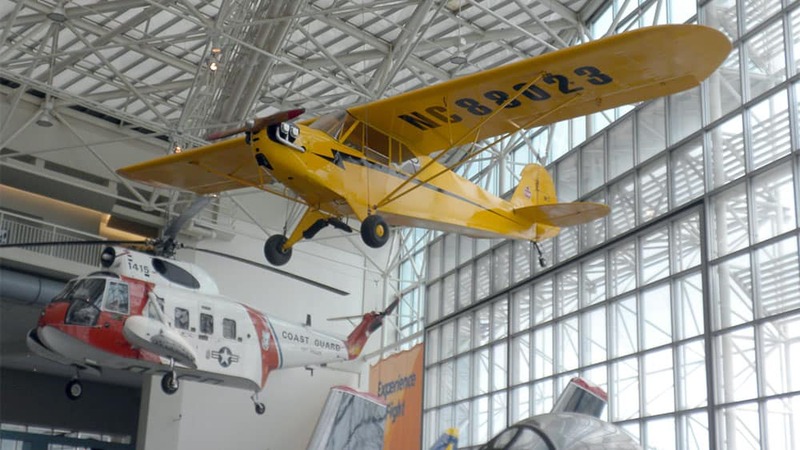 Do you have any great Aviation Museums to add to this list? Special Thanks to all those travel writing friends who contributed to this article. 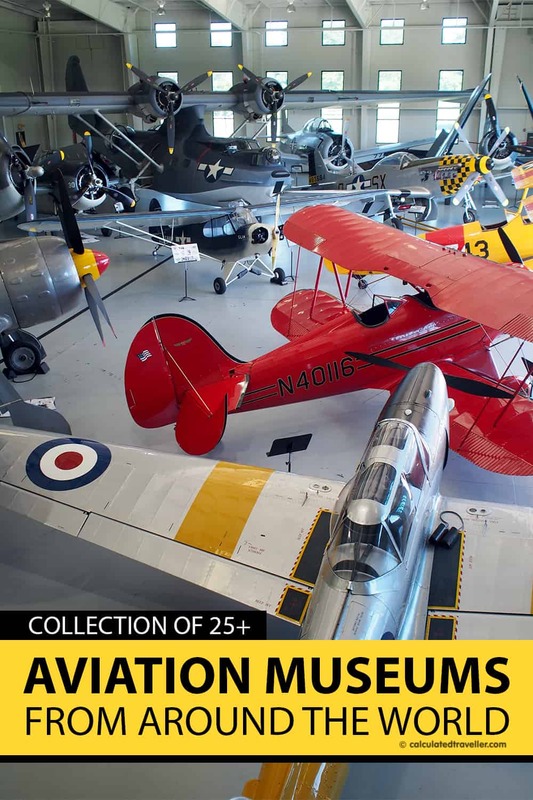 I hope to add more aviation museums to this list as I continue my travels around the world. The National Museum of the United States Air Force in Dayton, Ohio was left off the list. It is the largest military aviation museum in the world. I have visited there many times and always find something new and interesting. Thanks so much for letting us know about that one, Tony! There are so many aviation museums in the world that I’m not aware of. I hope to add to this list as time goes by so if you can think of any more, definitely let me know!